So Uzair is Ibrahim’s uncle on his father’s side, not his mother’s! Judging by the sketch you posted here (http://depleti.tumblr.com/post/36309179759/got-about-two-pages-into-thumbnailing-chapter-8) I thought he’d be related to Samarah — given the similar eye color, complexion, arched eyebrows, and slight smile (and also that the Caliph looks so much older). But I see that even in the sketch Uzair has the same slate-colored hair as his brother. Also, you’ve adjusted his eye color and facial hair. Moreover, I suppose that in polygamous families there could be very large age spreads between siblings if they don’t have to come from the same mother. 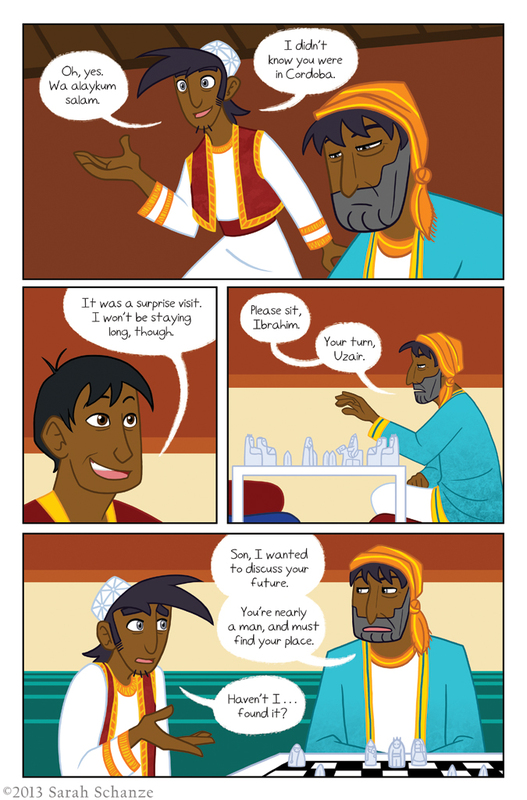 IIRC, Ibrahim is the Caliph’s 9th son, so his oldest half-brothers could be 20 years older (not to mention any older sisters he might have). Under his hat? Why, yes it is. There are many magical things under Ibrahim’s hat! No hat is as quantiously magical as mine! I bid ye, good day! Haha! He’s kind of a grumpy guy but he loves his babies. His face is so square. And droopy. I can just see him moving really, reeaally slowly, and talking really, reeaally slowly. And then pointing out that he just simultaneously put five different people in checkmate. Hahaha! That could be him. He’s not a superfluous guy. Despite his hat. So I guess he’s sending Ibrahim on a walkabout then? Thistil Mistil Kistil is a comic about vikings, Norse gods, and their adventures together (or against each other). When are we getting back to the above description? Hmmm if I do the calculations right, this chapter ends around June. Ibrahim’s gotta make his way north! Thanks for reading. Haha! That’s an interesting voice choice! Could be fun. Haha well we already know thievery is involved so it’s probably not going to be good. Hey, Sarah, on a kind of related note: how are you liking The Vikings on the History Channel? Haha, I haven’t been watching it. XD So I can’t say! I have to ask: What game are they playing? It looks a lot like chess, but as far as I know the variant they had there during that time had different pieces, and here all the pieces are the same color. Since I don’t know a lot about historical games, it wouldn’t surprise me if it was something I’d never heard of. Ah. I see. Interesting. I guess Ibrahim’s father would have access to fancy chess sets such as that even with the problem if importing it, being Caliph. Oh, and I noticed that, of the main cast, extroverted characters have blue eyes and brown hair, and introverted ones have grey eyes (okay, technically Loki has black-whited white eyes, but like we’re gonna see them soon given the secrecy deal), and I have to wonder if it’s intentional. After all, you seem to be very careful about colors, and it makes a lot of sense. Blue eyes hint at innocence and friendliness, and brown hair is a peaceful, warm color, while grey’s coldness tends to drive people away, especially for things that aren’t supposed to be grey. Ah. I see. Hedda seemed relatively extroverted to me, but then again, that’s mostly around Loki (who kind of radiates trustworthiness at least when in disguise) and Coal (who DID kind of save her life, which has got to make him seem a bit trustworthy), and besides, she seemed kind of shy around Loki’s kids. Come to think of it, I also forgot of a notable exception. Good ‘ol Rollo (who I do consider part of the main cast right now, if only because he’s too cute to be thought of as just a minor character) has BROWN eyes and is very, very, extroverted. Or possibly just Coaltroverted.